Don’t you love the way “Montenegro” sounds – so exotic, so James Bond. Everybody we talked to said we must go to Montenegro. So who was I to argue. So after a practice run with Anthony and Denise (and Brad and Bec) up to Otuk Sunj and back, we had a farewell dinner with Brad and Bec (who were heading off home), we said our goodbyes (including the formal ones to the Port Master and Police) and cast off bound for Porto Montenegro, some 28nm away. At first we had a lovely sail down the coast until we were about 5nm off turning into the Gulf of Kotor – the “Fjord of the Adriatic”. This magnificent series of three large basins is surrounded by mountains indescribably picturesque rising up from the sea to 1700m. From here the wind whistled through the mountains, hitting 40kts at times and always on the nose. After turning the corner into the Gulf, it took a couple of hours to get across to Porto Montenegro. Porto Montenegro gets the prize for the flashiest and best marina we have ever visited. We arrived at the change over to low season so it was 60 euro a night instead of double that. The marina sent a girl down to organise the check in to Montenegro – so easy. Then she organised a hire car for 45 euro a day so we could have a good look round as the wind was still up the next day. The hire car guy dropped it off right at the boat and did all the paperwork right there and then. We were starting to like this place. Having the car for a day was a real boon. There’s no need for a GPS – the country is so small and you can get lost for a little while but not for long. It was fantastic to get up into the mountains, the views are spectacular – just not so good getting down again. On our way down from the mountains, we took a road with 28 hair pin bends – one after the other. I’d done driving by the time I got to the bottom. We’d booked in to get some duty free fuel (half price, thereby paying for our visit easily), but the fuel dock was having some maintenance done so we couldn’t get it until 2pm. So we took the opportunity to do some more sightseeing – this time by boat. 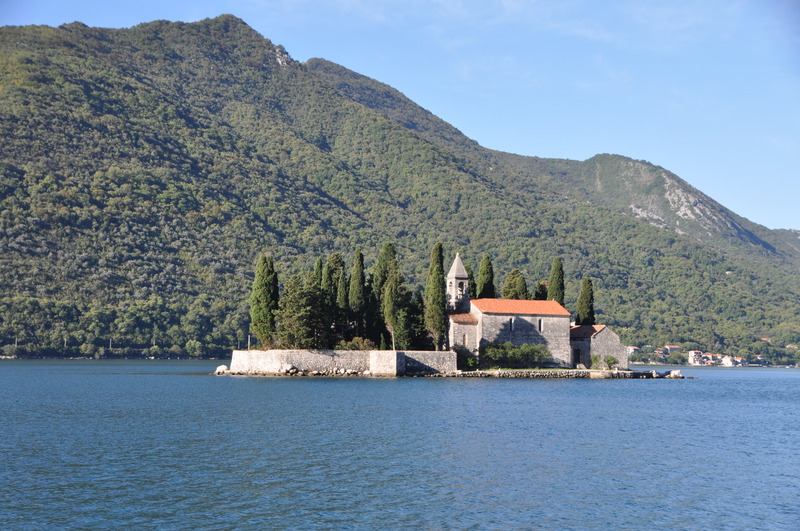 We checked out of the marina early and headed into the inner bays, where we went and saw the twin islands off Perast where there are two churches, one on each island. These islands are man made, evidently from the good people of Perast either dropping stones or filling captured pirate ships with stones and sinking them on the reef. Don’t you love a good pirate story. The churches’ construction was started in 1630 and the twin islands are well worth a visit. We also dropped by Kotor again, this time to see it from the sea. Back at Porto Montenegro, we stopped off at the chanderly to buy some Nespresso coffee capsules, something we couldn’t get anywhere in Croatia, before filling our tanks to brimming and heading off south, towards Corfu and the Greek Islands. This entry was posted in Montenegro and tagged kotor, porto montenegro by stull61. Bookmark the permalink.